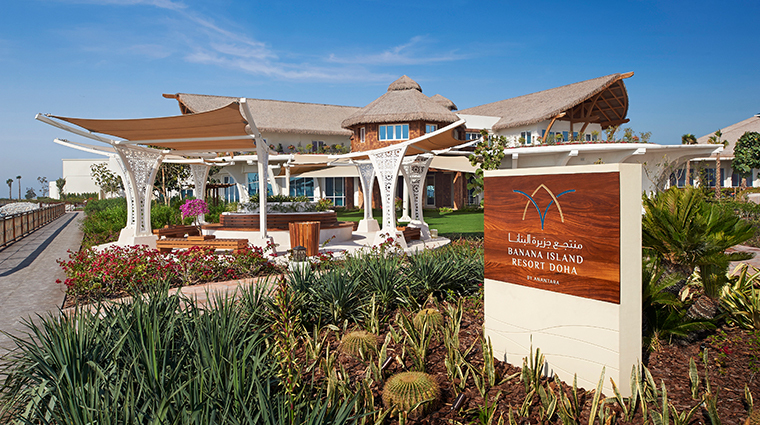 Just a 30-minute catamaran ride from Doha Port, Banana Island Resort Doha by Anantara is unlike anything else in the country. Blending Anantara’s Asian vibes with renowned Qatari hospitality, this is a unique destination. The experience starts the minute you check into the custom-built boat terminal on the shoreline of the Doha Corniche and settle in for the short but luxurious ride (dates, coffee and newspapers are offered) to the island, which is included in your room rate. The resort makes the most of its secluded location and calm, crystal-clear water with a half-mile stretch of sand and 328-foot-long lagoon for swimming, sunning or just lazing. Of the 141 accommodations, there are 11 Maldives-style overwater villas with private pools. To further promote an air of relaxation, the spacious spa delivers sumptuous treatments and the country’s only dedicated resort wellness center provides a range of holistic therapies and nutrient-rich sips to complement the feel-good experience. 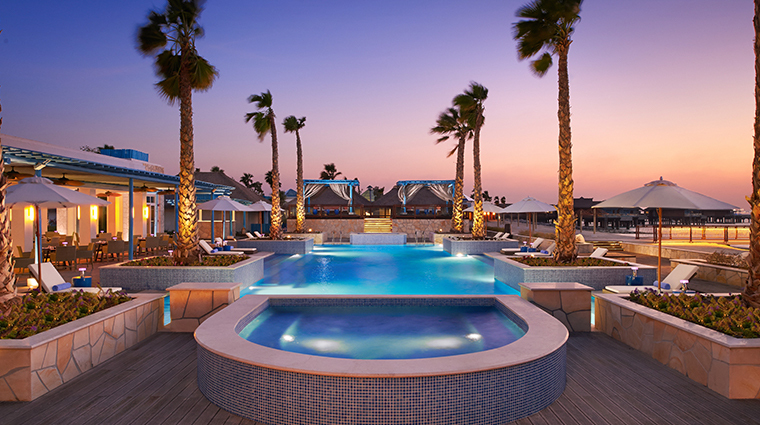 The “Island Welcome” — a festive greeting with drummers, clapping staff and trays of cool drinks as you hop off the boat — sets the tone for a stay at this Doha hotel. Even before the property was built, Banana Island was a favorite escape among locals. One look at the half-mile crescent-shaped beach will show you why. The wave pool and diving center with PADI certification availability is a rarity in Qatar. Lessons are taken in the pool before heading to the open water, where you can see vibrant sea life or even plant your own coral in the resort’s reef. The most attractive places to stay are the two- or three-bedroom overwater villas, whose private pools dangle off of the edge. Anantara Spa is the only facility in Qatar to provide doctor fish foot therapy. Settle in and let hundreds of tiny and very hungry fish nibble away at your dead skin cells. This is an alcohol-free resort, so don’t expect to find any wine-paired menus here. The far side of the island affords endless sea vistas, but the areas closest to the city have views of the airport. Ask for a room away from the large playground. On weekends and during vacation periods, this area can get noisy long into the night. Equipped with a games room, TV and large selection of toys, the Cool Mint Kid’s Club is overseen by trained caregivers — think of it as a gift for parents wanting to enjoy a little alone time. The boat journey to the island can get a little choppy, thanks to the strong winds that occasionally lash Qatar’s coast. 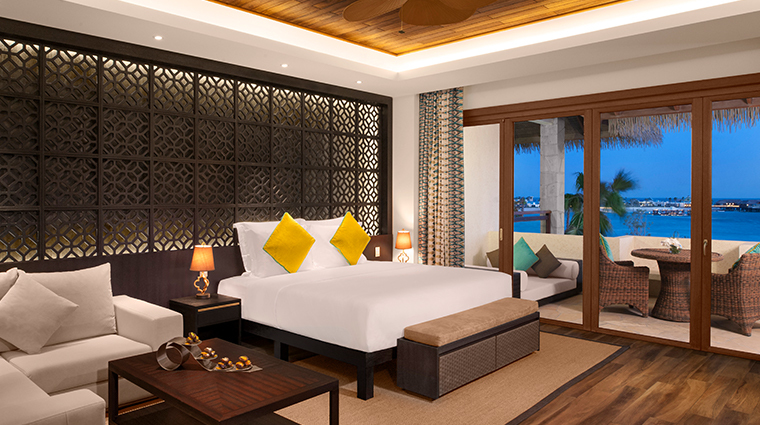 Even the smallest accommodation — the Premier Sea View Room — clocks in at nearly 500 square feet and has a small terrace overlooking the beach and Arabian Sea. 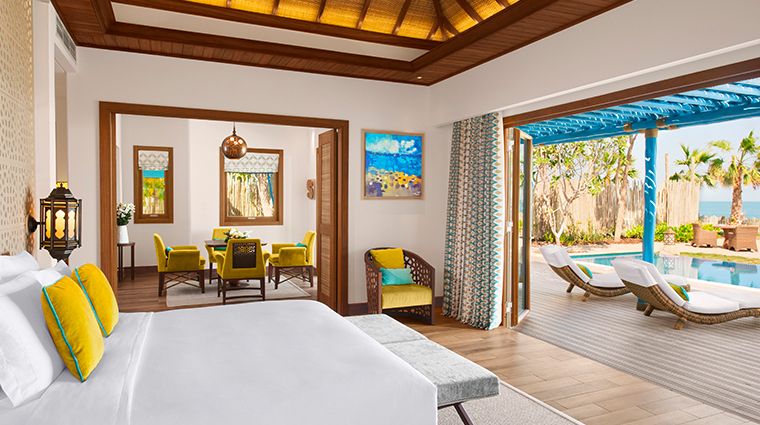 The Anantara Sea View Suite is nice for couples. Facing the beach, each space has its own patio with sun loungers. A special touch in each luxury hotel room is the deliciously inviting curved bathtub. The ones installed in the Anantara Suites are encased in small atriums, giving you the feeling of a serene soak outdoors. 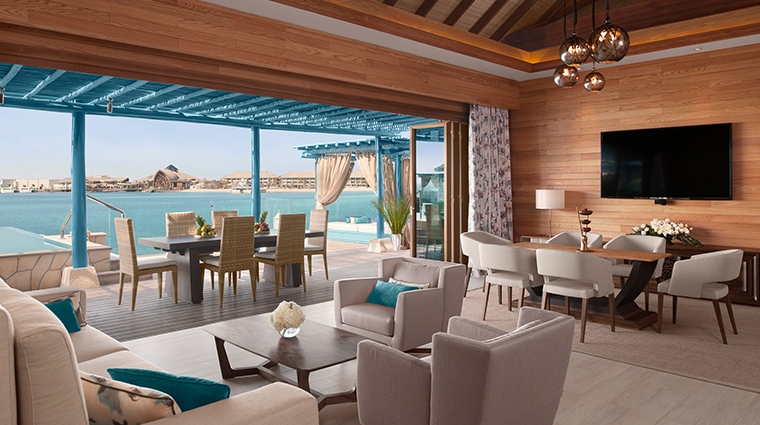 The Sea View Pool Villas are on the far side of the island facing the Arabian Gulf. Each comes with its own pool and a small shaded cabana for outdoor dining and lounging. Ted’s is designed to keep kids and the young at heart happy. American-diner-inspired highlights include the gooey triple cheeseburger and soft-shell shrimp tacos. Breakfast (and Friday brunch) is a lavish buffet affair at Azraq. Order eggs any style or sample Middle Eastern morning classics like foul (spiced and stewed fava beans with lemon and garlic). Q Lounge’s fantastic overwater location makes it a must-visit for Indian-inspired grilled fare and seafood. The biryani clay pots (made with chicken, lamb or vegetables) and juicy tandoori prawns are favorites, as is the decadent chocolate volcano dessert. After a meal at Q Lounge, retire to its spectacular circular overwater “bar” for shisha, live music and refreshing mocktails. The sleek Riva is the place to indulge your Italian food cravings. With a waterside terrace and a crowd-pleasing menu of pizza and pastas, it’s a great spot for a casual dinner.